In what's now become a crowded market of mechanical keyboards, one that Razer helped create, the peripheral maker is trying something new to stand out from the crowd. Razer's latest plank, the Ornata, uses brand new "Mecha-Membrane" technology, which is a fancy way of describing a hybrid key switch that combines elements from both membrane and mechanical designs. From Razer's vantage point, gamers and typists in general are split between choosing membrane rubber dome keyboards for the squishy comfort they provide, and mechanical planks for fast typing and distinct tactile feedback. The Mecha-Membrane is supposed to offer the best of both worlds. The new key cap is a mid-height design that sits between a full-height key cap and chiclet style key caps. It's made shorter to reduce the time it takes for your actions to register while offering both a soft cushioned touch of a membrane rubber dome with the tactile click of a mechanical switch. "The Razer Mecha-Membrane is the result of years of research and development that we’ve dedicated to build the best keyboards for gamers," says Min-Liang Tan, Razer co-founder and CEO. “When we moved to our own Razer Mechanical Switches in our production lines, we were excited to learn from real-use scenarios and apply that knowledge to perfect other technologies. The Razer Ornata is a great example of how our engineers can use feedback to innovate something truly amazing for gamers, in this case a solution that melds two seemingly disparate keyboard technologies for a phenomenal experience." We'll reserve judgement on Razer's design until we get a chance to spend some hands on time with an Ornata keyboard, though an early impression by The Verge is positive. If you like the loud clicks produced by Cherry MX Blues, it seems you'll probably love the noise produced by the Ornata. The Ornata also boasts individually backlit keys with customizable lighting schemes and a detachable ergonomic wrist rest that's magnetically held in place. 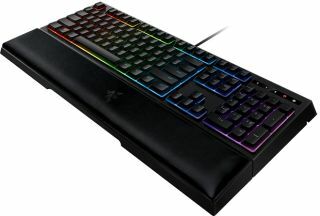 You can purchase the Razer Ornata now for $80 (€89.99) and the Razer Ornata Chroma for $100 (€110).